Can double headers save SA’s dwindling Super Rugby support? The Superhero double header last weekend drew over 50 000 spectators. SA’s four franchise coaches have their say. Dwindling spectator numbers have been one of South African rugby’s biggest headaches in the past few years, especially in Super Rugby. 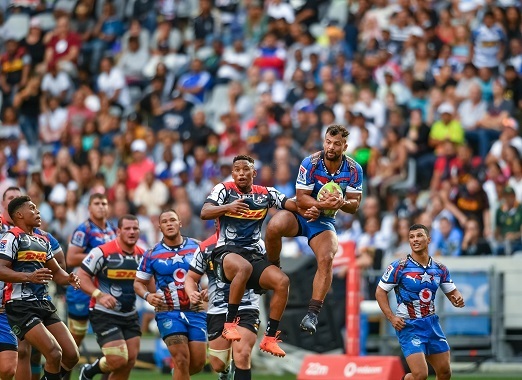 It was therefore almost freakish that over 50 000 people turned up for last weekend’s Superhero double-header, creating a magnificent atmosphere at the eminently suitable Cape Town Stadium. Should the double header concept be extended to the round-robin stages of the tournament? Franchise bigwigs have their say. I loved today. I saw my counterparts, we exchanged a dew ideas and it was more than just a couple of warm-up games. This is definitely a concept that can be taken further with a few tweaks. The players loved it. Look, if it’s going to draw the crowds, like it did here,then sure. This was fantastic. The venue is fantastic and the fact that 50 000 people were here said it all. I can definitely also say that the players loved it as well. There’s potential. From a preparation perspective, there was no better better way to prepare the players for a Super Rugby campaign than this weekend. This was a great initiative. We enjoyed the week’s build-up to this event, having the fans here supporting both games just shows that rugby is very important to South Africans. Long may this continue. It was a really important game actually for us. The intensity was surprisingly high and I’m glad we got through it. I thought it was an unbelievable experience. It reminded me of days past when we had “Test unions days”, where all six of the Test unions played on a single day. We had all four Super Rugby franchises here, playing on the same ground. The players loved it to play in front of a full house. If we have this during the Super Rugby campaign, then I’ll have no problem with it! (laughs) It’s certainly something to look at, especially if its going to draw crowds. We have a lot of different supporters groups in Gauteng, which will mean that Loftus or Ellis Park will be full with a diverse assembly of supporters.